Fewer than 1 in 6 small business have a disaster contingency plan and yet 57% of desktop users will abandon a site after waiting just 3 seconds for a webpage to load. When it comes to your business, it’s essential to bulletproof your infrastructure, ensure uptime and keep your customers from going to the competition. 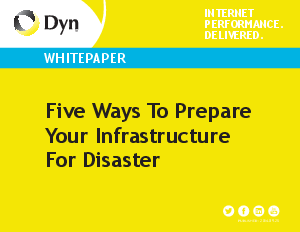 Read this whitepaper and learn the 5 ways to keeping your network up and your customers happy.